Heck, even politicians come to the library. Where else can you find so much information with people willing to help? If you can’t come in person, you can call (781-314-3425) or contact us via e-mail. If we can’t answer your questions, we can point you in the right direction. It’s not your grandparent’s library any more; besides books we have DVDs, CDs, audio books, Internet access via in-house computers, as well as wireless connection throughout, so you can bring your own laptop, or borrow one of ours. I’ve even seen people, using their laptops while enjoying our gardens, weather permitting. If we don’t have what you are looking for, we can try to locate the item at another location; either in our network or from a library out of our system. Then we can have it delivered to the Minuteman Library of your choosing for convenient pick up. Tax forms and information are available here. Come on in to pick up what you need, other than contacting the “taxing” agency, we seem to be the most convenient place to get them. You can search for your family’s roots in the Waltham Room. Help yourself, or call ahead for help from the local history specialist. Programs are available for people of all ages, whether it be story hour and play time in the Children’s Room or Opera, how-to seminars, book discussions, appearances by entertainers and civic group meetings in the Lecture Hall, there are many diverse opportunities offered at the library. I’ve known the Waltham Library for most of my life, as soon as I could print my name my Mom brought me in to get my very own card. What a thrill to be able to work in the place I’ve enjoyed throughout my life. It is one of the few city services my husband and I regularly use, we really enjoy getting something personal out of the taxes we pay. So come on in, get some value from the taxes you pay! Explore the Library it’s a great place to be. Two of my favorite things are fashion and film (please don’t tell my faithful canine companion Jumpin’ Jack Flash that he is number 3) And I’m not sure where this leaves my husband in the top ten roster. (be sure you’ll never see his face tattooed anywhere on my body). I digress. 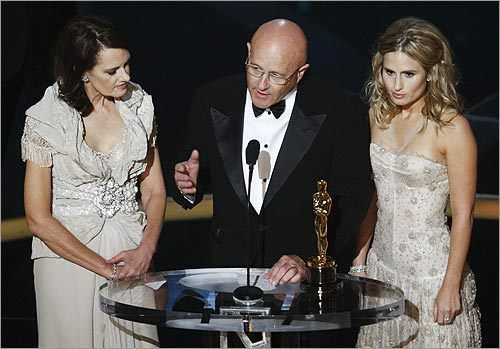 Although I watched the Academy Awards last night, I soon tired of them. Everything was long and overdone–except most of the women’s hair. I had read earlier, that jewelry and clothing were going to be scaled down as not to be too frivolous in these depressed times. And that did seem to be the case, although many of the dresses themselves did have some sparkle. I disliked far more of the dresses than I liked. I hate those one shouldered frocks. Even those skinny coat hanger model/actresses are not flattered by that asymmetrical look. That being said, I disliked Frieda Pinto’s gown. Did her dog eat the other sleeve right before she walked out the door? And that red number on Heidi Klum–kiss, kiss auf wiedersehen Heidi. Tilda Swinton was wearing her usual sack; while even a beautiful woman like Beyonce managed to look bad. And what’s up with all those fish tails? Marisa Tomei was drowning in her dress as was Miley Cyrus. I loved Frozen River–but poor Melissa Leo looked like she spent too much time in a frozen river. Reese Witherspoon looked like an ugly black and blue bruise. Mickey Rourke needed a good cleaning up. I know he’s in mourning for his dog and all but didn’t he want little Loki to be proud of his daddy? What is wrong with these people–don’t they have a full length mirror? Taraji P. Henson–great neckalce–finally some fancy jewelry. Don’t forget to visit the library to read about past Oscar winners and see past award winning films. Check out Made for Each Other : Fashion and the Academy Awards by Bronwyn Cosgrave and The Complete Book of Oscar Fashion by Reeve Chace. A little tired from watching the Oscars last night? Well, you’re not alone, I’m sure, as many wandered in bleary eyed from watching another over long Oscar telecast. If you had checked out your copy of Entertainment Weekly from the library, then chances are you did very well in your Oscar pool. They pretty much predicted every race correctly. If you came to the library to read The Boston Globe yesterday, and listened to their prediction that Slumdog Millionaire was going to clean up, then chances are you won your Oscar Pool. As a librarian, it was very gratifying to see movies based on books do so well. Slumdog Millionaire, winner of Best Picture, is actually based on the book Q&A by Vikas Swarup, (although the publisher is now publishing it under the title Slumdog Millionaire.) Best actress winner, Kate Winslet’s movie The Reader is based on a book of the same name by Bernhard Schlink. 1) Penelope Cruz: I think this woman would look beautiful even if she wore a paper bag to the Oscars, but she looked lovely in this dress. The embroidery is just enough, and her necklace doesn’t take away from the dress. Despite being strapless, it was also very modest, and in my opinion, age appropriate. This was my favorite look of the evening. 2) Natalie Portman: I’m sure some people were turned off by the rhinestones or beading in the front, and the sash in front was a little odd, I suppose. However, I love the color and I thought the dress really worked on her. She also carried off the strapless look in an elegant way. 3) Heath Ledger’s sister, Kate: I don’t know if it’s bad to mention her dress, but she looked stunning, and what an emotional moment when she referenced her late brother’s daughter. 4) Frieda Pinto: I know that Marialice doesn’t care for the one shoulder look on dresses, but I thought Pinto carried it off extremely well. In a night of black and white dresses, this royal blue sequined number really stood out. I liked her hair, as well. 5) The men: I have to say all of the guys looked very good in their low key tuxedos. 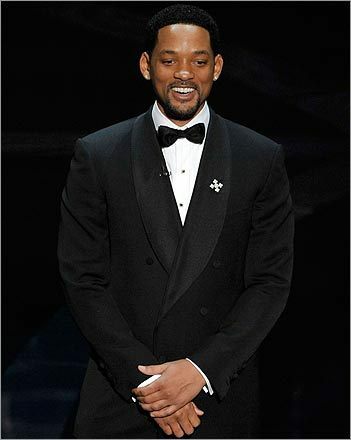 (Does Will Smith ever look bad in a tuxedo?) James Franco did look especially good mainly because he was on stage seconds after we saw him in character from Pineapple Express. 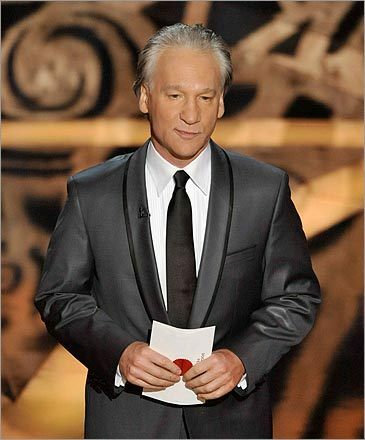 The only negative I have to say about the men was I really did not care for the leather looking tuxedo jacket that Bill Maher was wearing. 1) Jessica Biel: Jessica Biel was this year’s random celebrity who got to preside over the Technology awards. I’m sure she’s a lovely person, but I did not like that dress. It had a lot of potential and it was such a nice shade of white, but that thing (whatever it was) in the front was so distracting. Her hair was messy, too. She pulled off her out of the ordinary dress at the Science and Technology awards much better, I thought. I guess it would have been a faux pas if she had worn that, again. 2) Jennifer Aniston: I actually didn’t have an issue with her dress, but her hair was too messy. 4) Amanda Seyfried: The color was pretty, but that bow just takes away from the dress. This isn’t quite as bad as Jessica Biel’s, but I didn’t love it. However, I do appreciate that Seyfriend was wearing two straps, unlike most other other women. 5) Sophia Loren: This really pains me to say this. I love Sophia Loren. I owned a dress in college that I named Sophia Loren because it reminded me of a dress she wore in one of her movies. However, I did not love Sophia in this dress. But, you know what? She’s Sophia Loren and as far I’m concerned, she can do whatever she wants. Okay, over to Marialice for her take on last night’s fashions. * Bentley University is once again providing tax help for the VITA Program. The program starts on Saturday, February 14 at 11 am and will run Tuesdays and Thursdays from 5-8 and Saturdays from 11-4 in room 101 in the Morrison Building on the Bentley University Campus. There will be no help during spring vacation, from March 7 -15. If you have questions call 781-891-2714. The appointments are first come, first serve basis, only. Update March 2: According to Boston.Com, the IRS has called March 21 Super Saturday and is planning on offering free tax assistance to those making $42,000 or less. Assistance in Boston will be held at the JFK at 15 New Sudbury Street from 9 am to 2 pm on March 21. More information is available here. Country Music Awards. I set my TIVO and watch them later, blowing through the acceptance speeches. I am only interested in the gowns, the hair styles, the shoes and the jewels. It got me thinking–what about movies with great fashion. For those who don’t know, the 200th anniversary of Abraham Lincoln’s birth is on February 12. Read below for some reviews of new books about the 16th president and for the local connection regarding the last known photograph of him. Last known photograph of Abraham Lincoln. Taken by Waltham Photographer, Henry F. Warren. Did you know that this year is the 200th birthday of President Lincoln? We’re remembering with him with a new display outside the Waltham Room called “The Last photo of President Lincoln by Waltham Photographer Henry F.Warren.” Our local photog captured that honor when he took three pictures of him out on the south balcony of the White House. That was on March 6, 1865. After much controversy over who had really taken the last photos, Warren came out the winner of the “contest” when new information was found in a diary. Although the original negatives were lost, many prints were made and are highly prized by collectors today. February 12th is the bicentennial anniversary of the birth of Abraham Lincoln. No doubt you have noticed the many new books written about the life, presidency and death of the 16th president of the United States. her role in the assassination plot. Manhunt: the Twelve Day Chase for Lincoln’s Killer by James Swanson tells the story of the twelve days immediately following the Lincoln assassination and the frantic search for Booth. This tragic episode in our history can also be viewed on the DVD Hunt for John Wilkes Booth. All of the events leading up to the capture of Booth are dramatically portrayed in this presentation.